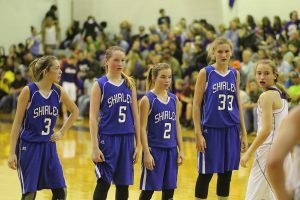 Shirley, AR – The Shirley Junior Girls (8-3, 4-0) completed the first half of their season with a disappointing loss to the 2A Quitman Bulldogs in the 2nd round of the Greers Ferry Lake Classic. The defeat ended a six game winning streak for Shirley. 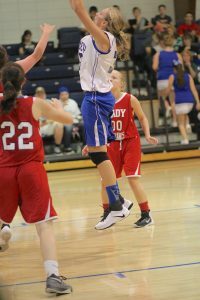 The Lady Blue Devils defeated the Concord Pirates to reach the semifinals of the tournament. 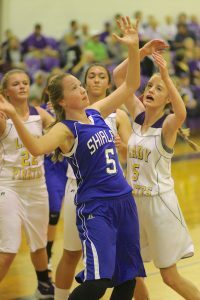 Point guard Trista Doty and forward Erika Phillips had 10 points each in the winning effort against the Pirates. The Lady Blue Devils began the season with five nonconference opponents. Shirley opened up with an impressive win over Abundant Life 43 to 21. Guard Teigha Black led all scorers with 17 points. Forward Greyson Berry contributed 14 points against the Owls. Next the Lady Devils traveled to Mount Vernon-Enola to take on the Warhawks. Shirley could not generate any offense losing to the Warhawks by double digits. Shirley rebounded from the loss at home against Nemo Vista defeating the Redhawks 37 to 11. Doty led all scorers with 13 points. Phillips also had a strong performance scoring 10 of her 11 points in the first half as the Devils pulled out to a 27 to 11 advantage by intermission. Shirley traveled to Concord in early November to participate in the Julian Martin Tournament. The Devils suffered their second loss of the season against the Eagles of Bradford. The game was close throughout with the Eagles pulling away in the final minutes. The Lady Blue Devils again rebounded, this time on the road, defeating the Guy-Perkins Thunderbirds 26 to 22 in their next game. Berry had 12 points in the low scoring affair. The victory over Guy-Perkins was the beginning of a six game winning streak for the Blue Devils which included four conference wins. Shirley defeated Rural Special 35 to 20 and Concord 37 to 36 on the road for conference wins. Berry led all scorers in each game with 10 against the Rebels and 18 against the Pirates. 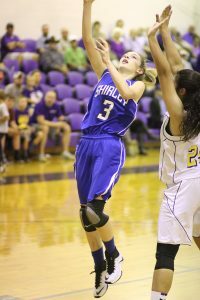 Phillips hit two critical free throws with time running out to give Shirley the victory against Concord. 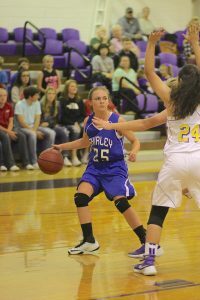 The Lady Blue Devils began December by defeating arch rival and Coach Tutor’s alma mater, Greers Ferry Westside 55 to 44. Phillips had 18 to lead all scorers in the home conference opener. Doty hit four shots from beyond the arc and contributed 15 points in the victory. Coach Tutor’s Lady Blue Devils concluded the first half of conference play undefeated with a home victory over the Midland Mustangs 36 to 24. Phillips and Doty led all scorers with 10 a piece. Doty had three – 3 pointers in the game. Over the last six games Trista has average three – 3 pointers a game. Next up, the Blue Devils travel to Timbo on January 5 to play the Tigers in a conference game.